You can create a folded booklet or newsletter that has 8.5-by-11-inch pages if your printer supports printing on 11-by-17-inch (or tabloid) paper. While this article refers to standard US letter-size pages (8.5 x 11), you can use this technique with any publication whose page size is half that of the paper size. Open the publication that you want to print as a folded booklet. 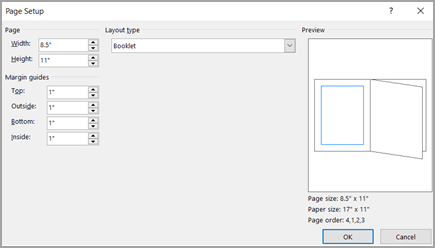 In the Page Setup dialog box, under Layout type, click Booklet. Make sure that the Width is 8.5 and the Height is 11. 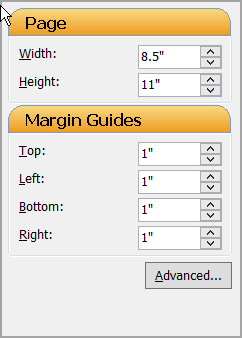 Under Margin Guides, change the margins if you want. If you are prompted to automatically insert pages, click Yes. 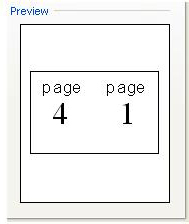 Microsoft Publisher will insert pages so that the total number is a multiple of four, because one sheet of paper becomes four pages. Note: Your booklet will print correctly only when the total number of pages is a multiple of four, but you don't have to place content on all four of the inserted pages. You can leave some of them blank. 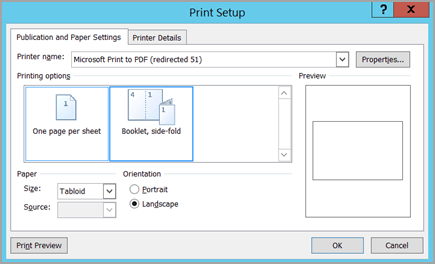 In the Print dialog box, under Printer, select a printer that can print on 11 x 17 or tabloid paper. Select any other options that you want, and then click OK to print the publication. Microsoft Office Publisher prints the first and last pages on one side of the sheet of paper, the second and next-to-last on the other side of the sheet, and so on, as shown here. If your printer doesn't support two-sided printing, Microsoft Publisher prints the first and last pages on one sheet of paper, the second and next-to-last on another sheet, and so on. When you photocopy the pages back to back, fold, and then staple or bind them together, they will be in the right order. Alternatively, you can use manual 2-sided printing. In the Format Publication task pane, under Publication Options, click Change Page Size. 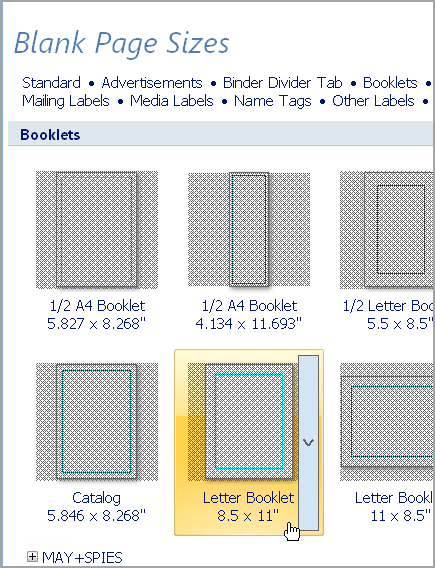 In the Page Setup dialog box, under Blank Page Sizes, click Booklets, and then click Letter Booklet 8.5 x 11". 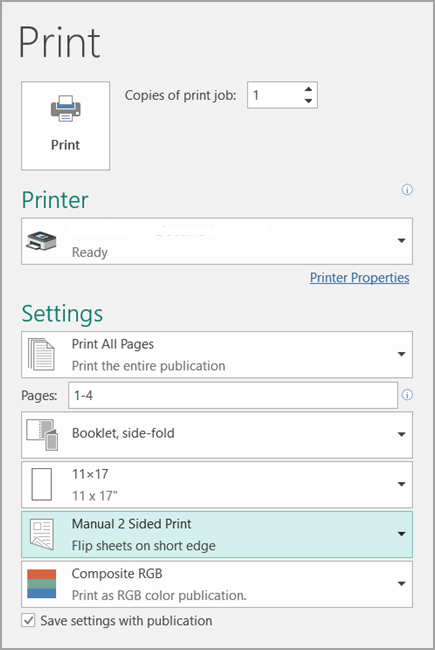 On the File menu, click Print Setup, and then click the Publication and Paper Settings tab. Under Paper, verify that the 11-by-17-inch or tabloid paper size is selected. Under Orientation, verify that Landscape is selected. Under Printing options, select Booklet, side-fold. If Booklet, side-fold is not an available option, the selected paper size may be too small for the pages. Make sure that the paper size is twice the page size. Under Preview, you can see how two of the pages will appear when they are printed on one tabloid sheet. If you are prompted to automatically insert pages, click Yes. 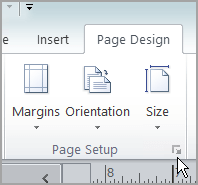 Microsoft Office Publisher will insert pages so that the total number is a multiple of four, because one sheet of paper becomes four pages. On the File menu, click Print, and then click the Publication and Paper Settings tab. In the Print dialog box, under Printing options, verify that Booklet, side-fold is selected. Note: If your printer supports two-sided printing (or duplex printing), make sure that Two-sided or Two-sided, flip short side is selected under 2-sided printing options. If your printer doesn't support two-sided printing, Microsoft Office Publisher prints the first and last pages on one sheet of paper, the second and next-to-last on another sheet, and so on. When you photocopy the pages back to back, fold, and then staple or bind them together, they will be in the right order.